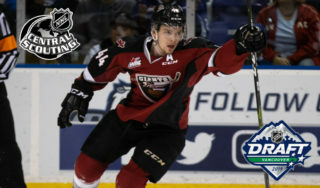 Saturday night at the Langley Events Centre the Vancouver Giants (16-6-2-0) earned their 16th victory of the 2018-19 season. 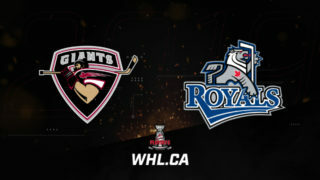 Davis Koch and Milos Roman each had a goal and an assist and Trent Miner made 24 saves on 25 shots faced as the Giants handed the Victoria Royals (12-8) a 4-1 defeat in front of 3640-strong at the LEC. Tanner Sidaway had Victoria’s lone goal that came in the late stages of the third period. Special teams played a big part in the game as the Giants went one-for-five on the power play, scored their second shorthanded goal of the season and killed off all nine of Victoria’s power play chances. The Giants have won two straight. Mid-way through the first period at 10:46, Milos Roman bagged his team-leading 12th goal of the season for the Vancouver Giants on their first power play chance of the game. Roman’s marker was assisted by both Bowen Byram and Davis Koch. The G-Men outshot Victoria 10-6 in the opening frame and killed off two Victoria power play chances. The Giants tacked on two more goals in a penalty-filled second period. 2:24 into the middle frame Davis Koch raced down the left-wing and snuck his sixth goal of the season under the glove of Royals starter Griffen Outhouse. 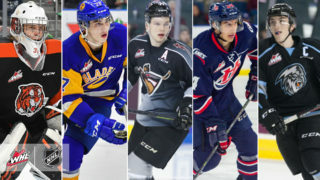 Then, at 18:33 of the period, captain Jared Dmytriw netted his fifth goal of the season on a partial short-handed breakaway to extend Vancouver’s lead to 3-0. The Giants managed two goals in the second period despite having to kill off five Victoria power play chances. 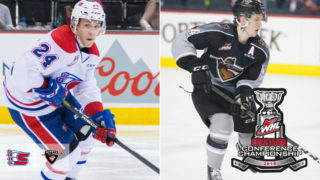 Rookie Justin Sourdif gave the Giants a 4-0 lead at the 11:09 mark of the final period when Brayden Watt’s shot attempted bounced off a Royals defender and right to him in the high slot. Sourdif wired his sixth up and over Griffen Outhouse to supply the Giants with their final goal of the game. Trent Miner’s shutout bid was ruined at 16:17 when Royals forward Tanner Sidaway knocked home his third of the season through Miner off a scrum in front of the Giants goal. 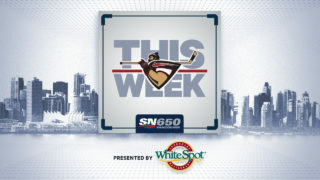 Vancouver Giants Next Game: Tuesday night, at home against the Saskatoon Blades at 7 PM. Davis Koch and Dylan Plouffe both extended their point-streaks to five games apiece. Koch has compiled three goals and seven assists for 10 points in his last five games while Plouffe has notched two goals and five assists for seven points in that span. The Giants improved their home record to 10-4-1-0, and their record against the B.C. Division to 9-2-1-0. They are now 2-1-1-0 against the Royals through four matchups. With 24 saves, Trent Miner improved his record to 8-1-1-0. His save percentage ranks second in the WHL at .944 and his goals-against-average of 1.60 also ranks second in the entire WHL. 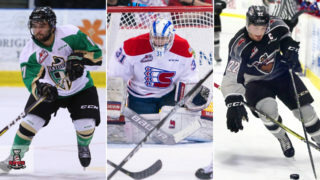 Through 24 games the Vancouver Giants are 10 points ahead of their pace from a season ago.